“I thank God everyday for tacos pretty much,” Cesar Aldape told MySA.com, and he probably wasn’t exaggerating. 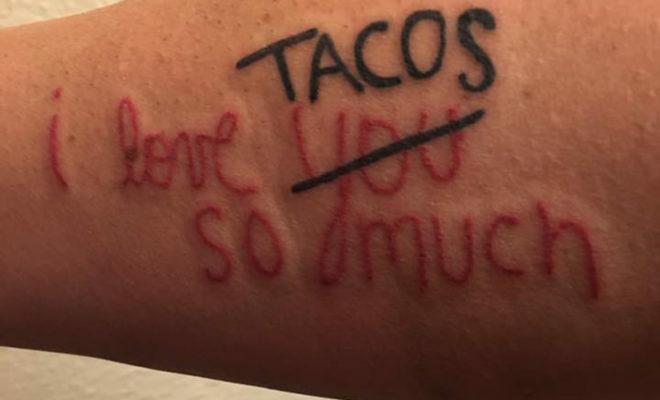 The 46-year-old San Antonio man recently got a tattoo that declares his love for tacos. Aldape went to the local Old Glory Tattoo on Tuesday morning to get a replica of the instantly recognizable “I love tacos so much” graffiti artwork at Viva Tacoland. The piece of graffiti was created by Luis Munoz who was riffing off of the Austin classic located at Jo’s Coffee on South Congress which reads “I love you so much.” Munoz hasn’t met Aldape yet, but he’s thrilled his work has such dedicated admirers. Tourists and locals are constantly taking their photo in front of the declaration of love in both locations. Aldape’s friends think it’s crazy, but in a good way. 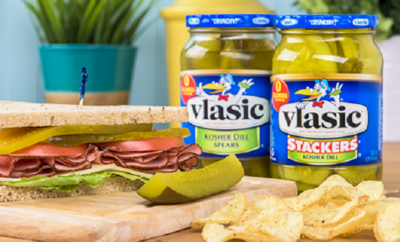 They refer to him as the “Taco Man” since they all know how serious he is about his devotion to the food. Still, when he uploaded the photos of his new tattoo that will be constantly visible on his forearm, many people on his Facebook page had to ask, “Is that real?” Aldape confirms it’s real, and he’s proud to be making it Facebook official.